When Is It Okay (If Ever) To Fail the Bechdel Test? Prompted by Charlie Jane Anders' discussion of the test today (as well as some of the reactions I've seen to it) I've given some thought to the Bechdel Test and whether it's ever okay for a story to fail it. There are a number of popular stories which do fail it - Pacific Rim, The Lord of the Rings, the original Star Wars Trilogy (but not the Prequels), and even the acclaimed Run Lola Run. And I guess what I'm wondering is... should we give them a pass anyway, particularly if we like their heroines? To a certain extent, I can buy into the argument that having a well-developed female character with her own narrative arc that isn't just about supporting other men is a good substitute... but really, it kind of ignores the entire point of the Bechdel Test in the first place, which is not just to address the lack of female agency in films - but the lack of women in film at all. Seriously, I'm not sure there's really any good reason that Pacific Rim features only two female characters, only one of whom gets more than a handful of lines. Or that they never speak to each other in the entire film. Why is the entire PPDC senior staff made up of men? Why aren't any of the scientists women? And the argument that Mako Mori's narrative is independent of the men around her isn't entirely true either - Mako's only substantive interactions at all are with Becket (her co-pilot) or Pentecost (her surrogate father), so in a way she is defined very much by her relationships with men (even if they aren't of a sexual nature). Contrast this, conversely, with Neon Genesis Evangelion, a series Pacific Rim is frequently (but unfairly in my mind) compared to. 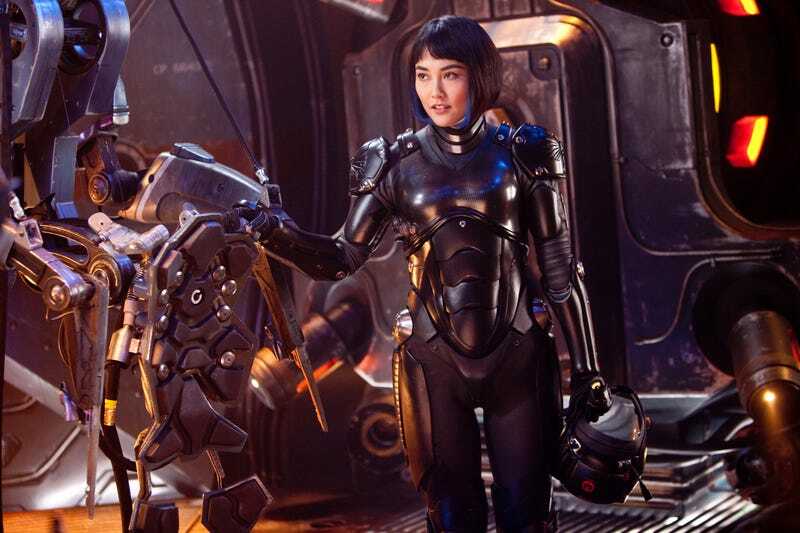 Where Pacific Rim has just two female characters (Mako Mori and Sasha Kaidanovsky), Neon Genesis Evangelion has nine. And while it's true some of those are fairly minor characters, Misato, Rei, and Asuka are definitely just as important to the story as Mako is. Not only that, but NGE passes the Bechdel Test with flying colors: the female characters are constantly interacting with one another in ways that have little or nothing to do with the male characters. It's not just Pacific Rim though (even if I think it's an important example). X-Men: Days of Future Past passes the Bechdel Test on what amounts to a technicality (Mystique briefly talks to Trask's secretary while disguised as him) but otherwise is completely devoid of any interactions between its principle female characters. Indeed, bit parts aside Mystique's the only female character in the film's primary setting, the 1970s, and all her chief interactions are with men, such as Xavier (her foster brother) or Magneto (her implied former lover). I still think she's a well-written character with a great arc and I don't want to come across as though I'm denigrating either her or Mako Mori. But the fact of the matter is that the more I think about it the more I wonder... why? Why couldn't there have been another female mutants in the 1970s? There's plenty to draw from in the comics. The movie could have featured Scarlet Witch, the twin sister of Quicksilver, who's sole action scene has already made him a fan favorite. Or Singer and Kinberg could have brought Mystique's frequent partner (and implied love interest) Destiny to the screen, which certainly would have fit with her going her separate ways from both Charles and Erik. But no, like Mako, Mystique operates in a world of men. My point here isn't to say these are bad films. They're not; I really enjoyed both of them and I think they each feature (one) really well-developed and interesting female character. But to say that they fail the Bechdel Test is really no big deal seems disingenuous to me. It seems like an excuse, a way to give a pass to what we do like while still giving us the opportunity to decry that which we don't. Which is intellectually dishonest. It's okay to like something even if you think parts of it are problematic. What's not okay is to sweep those problems under the rug and ignore them, even if you know they're there.